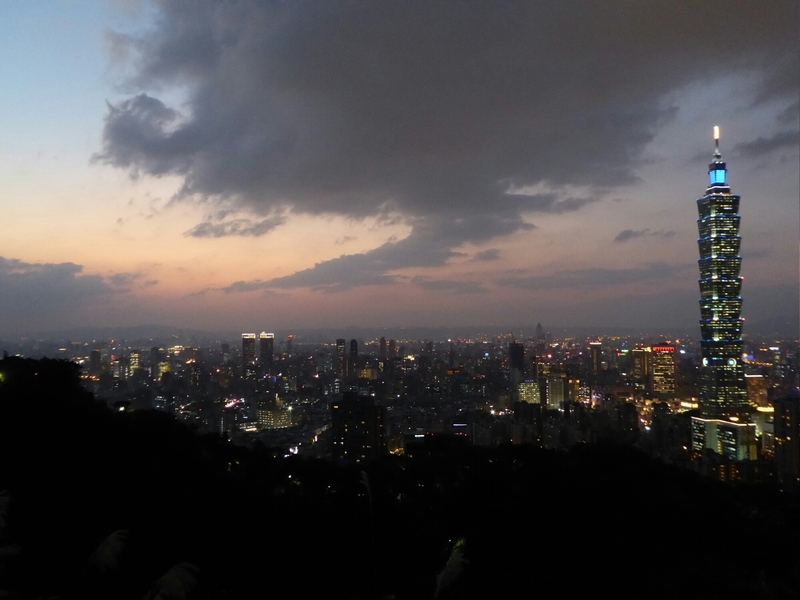 Taipei is such a fabulous city that today we plan to bathe in thermal springs and see the sunset from a mountain. We MRT to Beitou, then catch a spur line to Xinbeitou and as we leave the carriage the smell of sulphur assaults our nostrils. On the way to the thermal pool we visit an aboriginal cultural centre which is very informative. 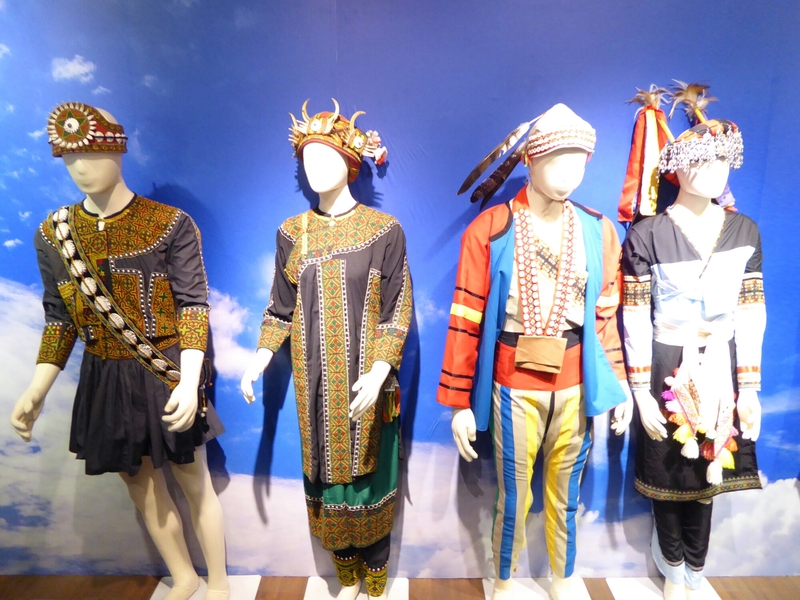 There are examples of different indigenous costumes, historical artefacts and artworks with explanations in English. 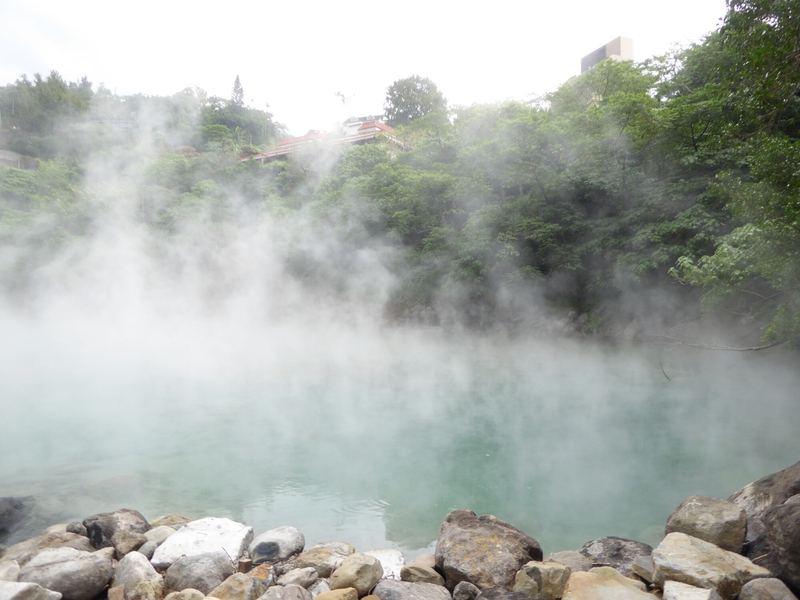 We continue up to the pool, which is just some warm water with steam coming off, but is, for some reason, entrancing. The colour is beautiful and people armed with selfie sticks snap away. There is a man beating a drum and chanting which adds to the atmosphere. We then head to a thermal spa where its cheaper to hire a private room for an hour than pay for two people to have unlimited time. 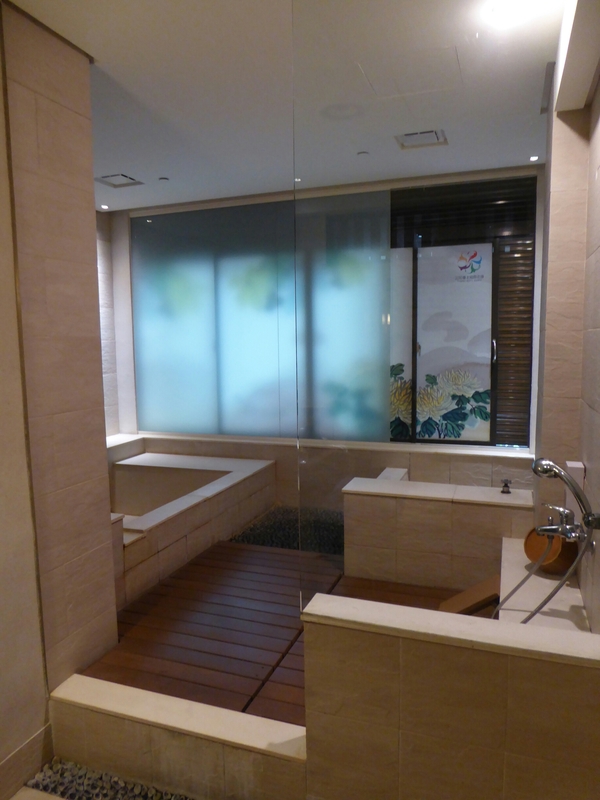 We opt for a room which also has a cold pool and having experienced onsens in Japan, we know the drill. Strip, shower and dive in. We are thankful for the cold pool. We relax and before you can say ‘it ain’t half hot mum’ the phone rings and our hour is over. We emerge red faced and sweating. 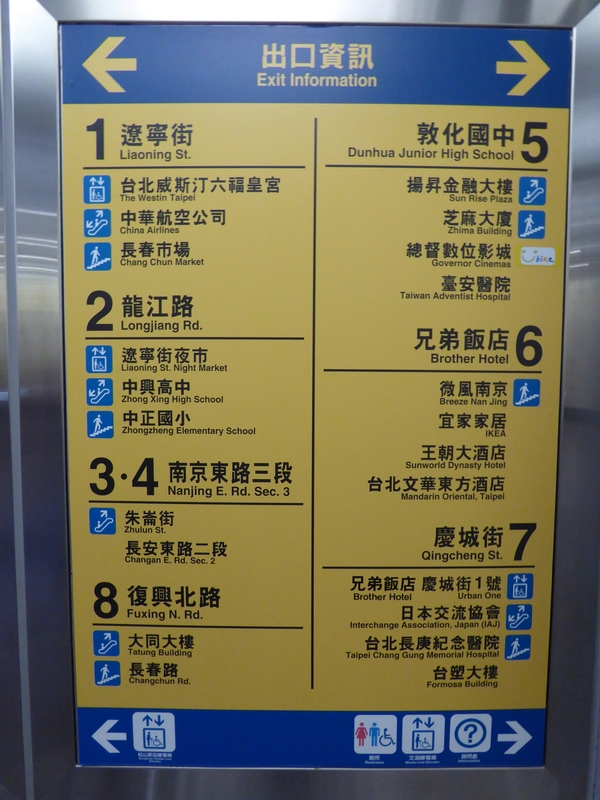 After some ordinary noodles we travel the red MRT line to its eastern terminus at Xiangshan. There are English signs for elephant mountain which we follow and begin climbing the stone steps to the summit. Its the second time today we are red faced and sweating. Near the top we come across loads of teenagers photographing each other on top of a boulder. We carry on upwards until we find a quiet viewing spot. Weary legs are rested and we watch the sky turn orange and the sun fade to red. 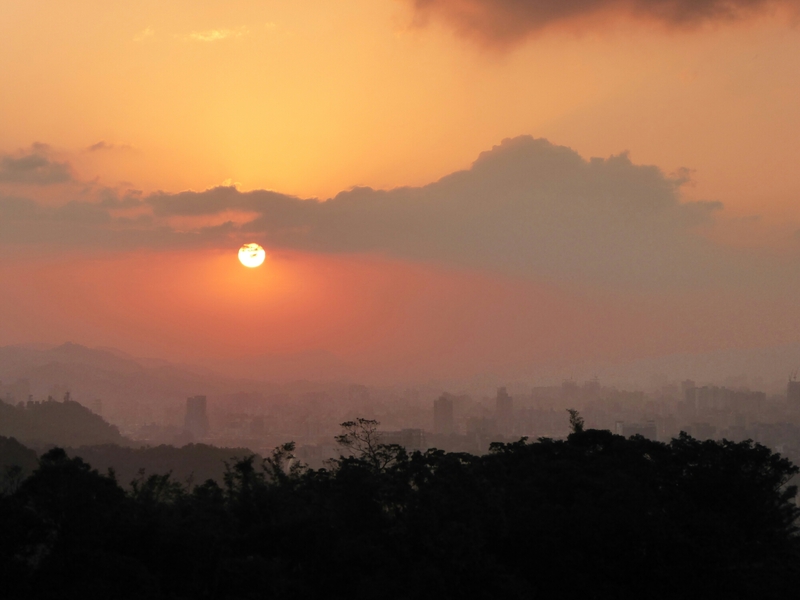 In front of us Taipei looks wonderful. Initially misty in the orange glow, as dusk settles it slowly lights up, until a modern metropolis sparkles. We’re hypnotized by the artificial beauty and I think of the cityscapes in the movie Blade Runner. 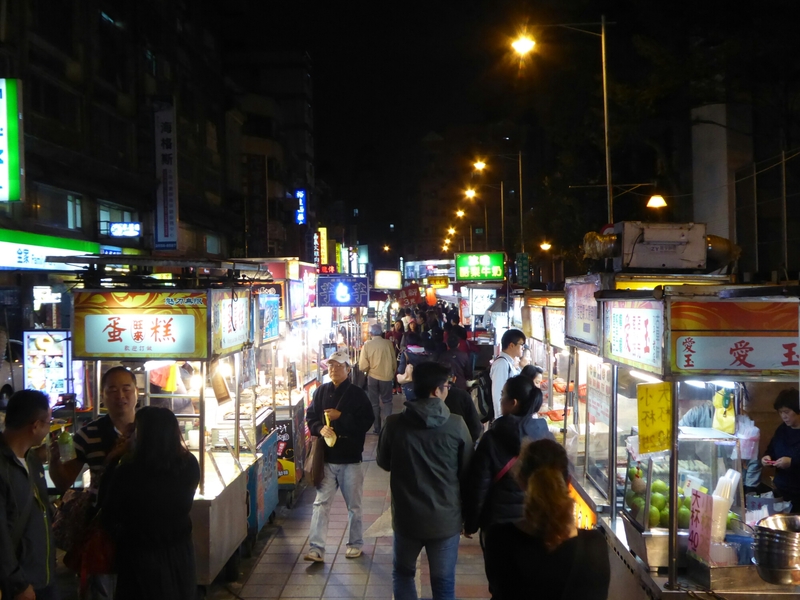 Liaoning night market provides us with the dumplings we crave and the layout is a bit different to Shilin and Raohe night markets where small stalls provide food. Here its restaurants. We spend the evening writing Xmas postcards to everyone in blighty. They’re on their way folks! 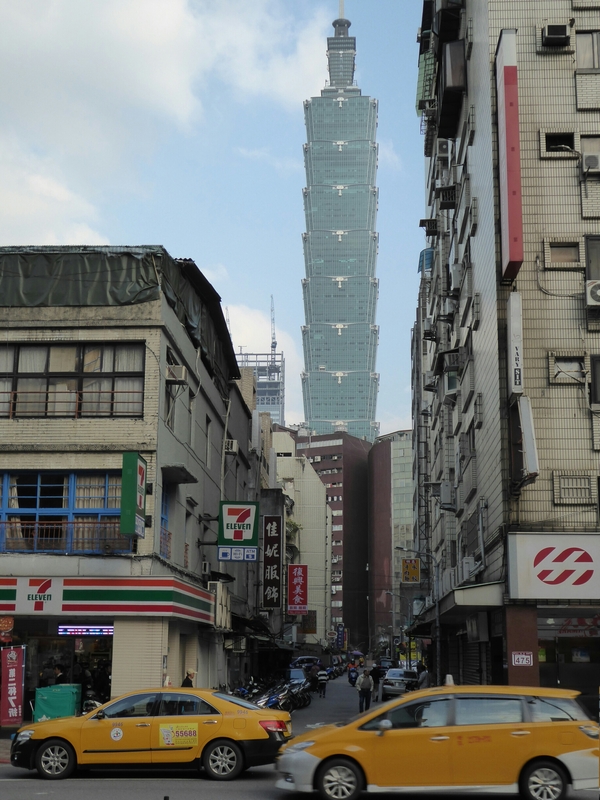 So we are moving Taipei homes today as we have seen too little of Taipei and unfortunately Fiona is booked up so we are off to the CBD district. First though we need cash and lunch both of which were found in our wonderful neighbourhood. We also see loads of cockroaches splattered or dying on the street and see some guys with massive exterminator gas contraptions, we assume the 2 are related. 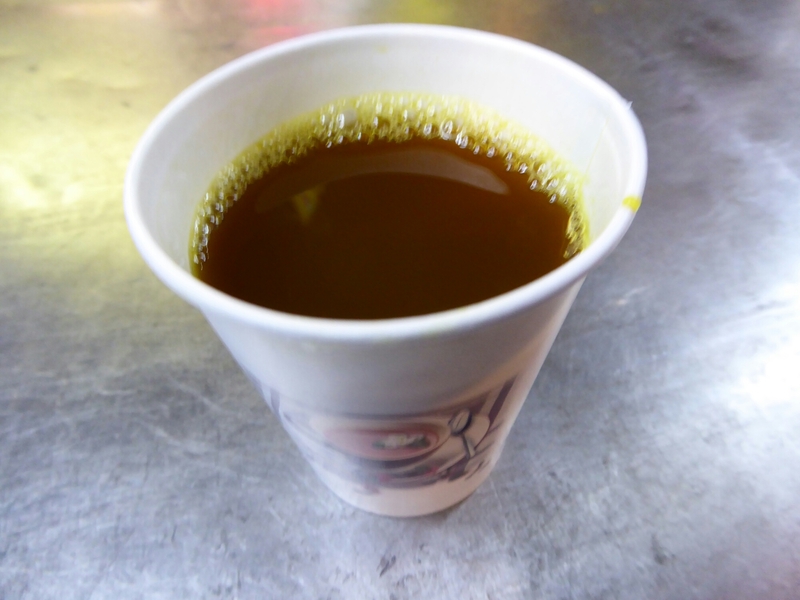 Breakfast drink first, I am boring and have black coffee, Guy has Chinese Milk with Jobs Tears, and that wasn’t even using Google translate! 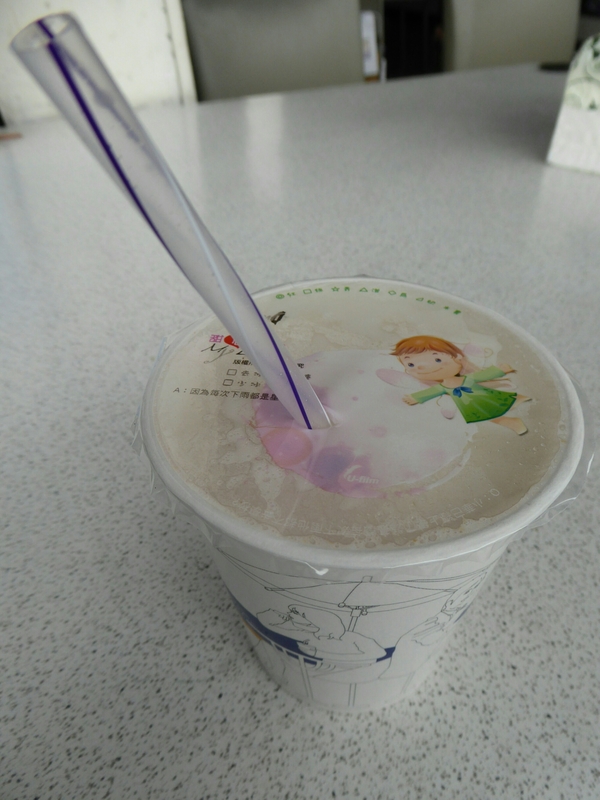 We think it was soya milk with something, if that helps? 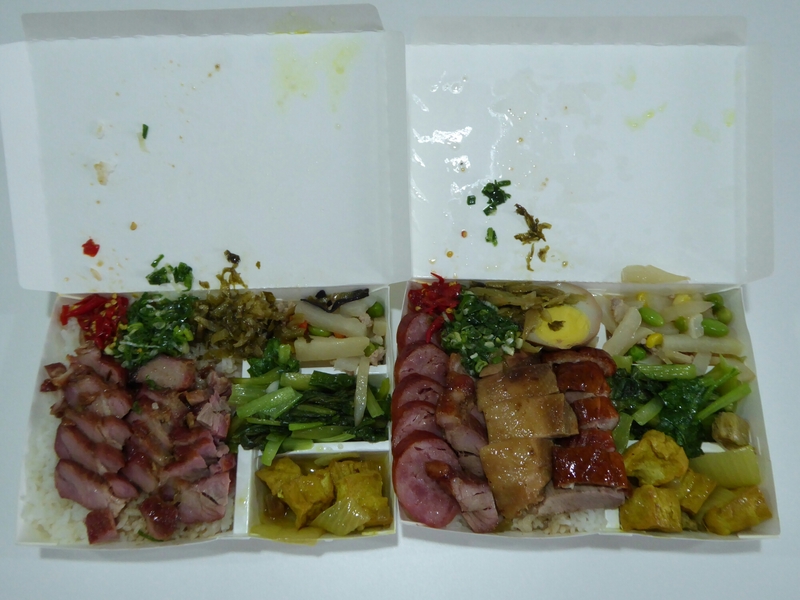 Lunch is a meat bento box, looks great and tastes even better. And we have vegetables!!!!! We transfer to our new abode within an hour. It is not as good as Fiona’s place, it is just a room with ensuite, bad WiFi and a warning not to tell the neighbours you are Air BnB’ing, but it is interesting to be in a different part of town. 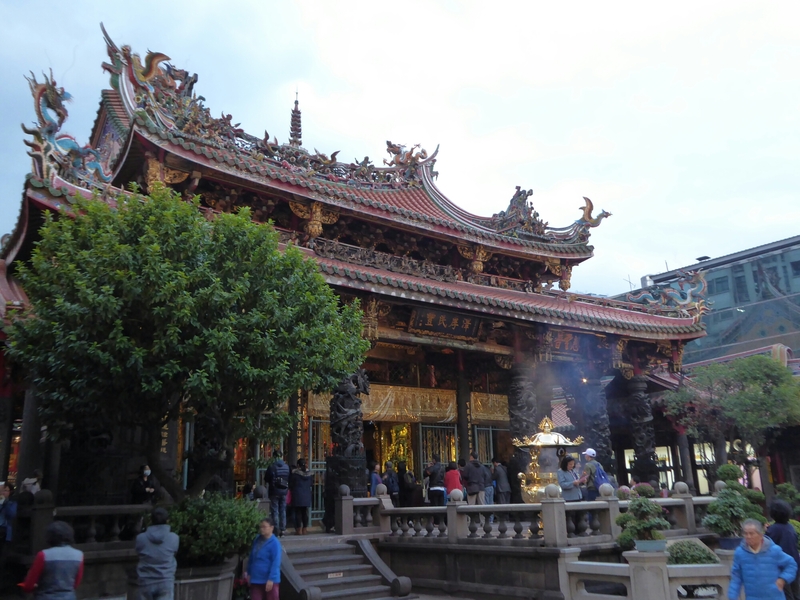 We get the tube to Longshan temple, one of the main temples in Taipei, we luckily get there just as the nuns are doing their evening chanting, it is a really atmospheric experience with incense and everyone praying to the different gods and chanting. 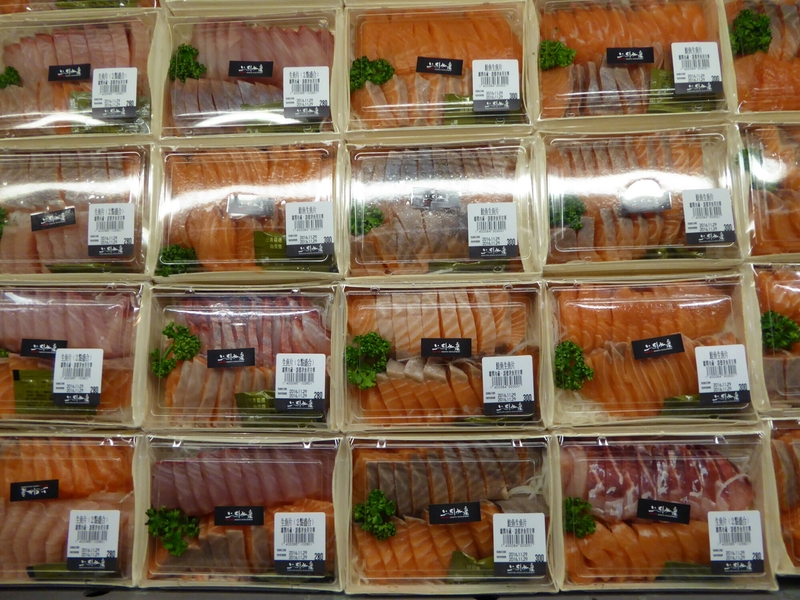 We need food so are off to Ningxia market which is supposed to be one of the better ones, but we were disappointed. 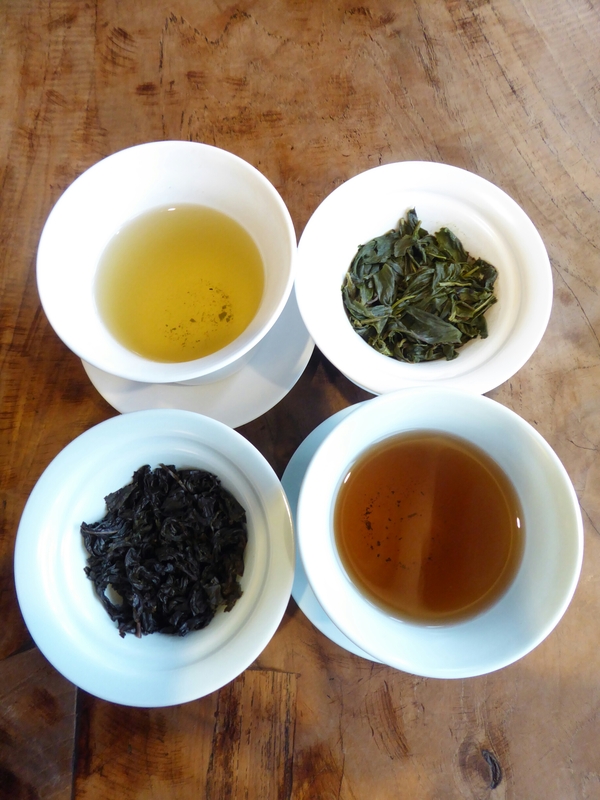 There isn’t much different food there, but we do have bitter tea. It is bitter, worse that the strongest builders tea you can imagine. I try exploding chicken roll, it didn’t explode, apparently that can happen when you bite into it. It was chicken meat wrapped in chicken skin, dusted in spices, bbq til crispy on outside and juicy in the inside, it tasted delicious. 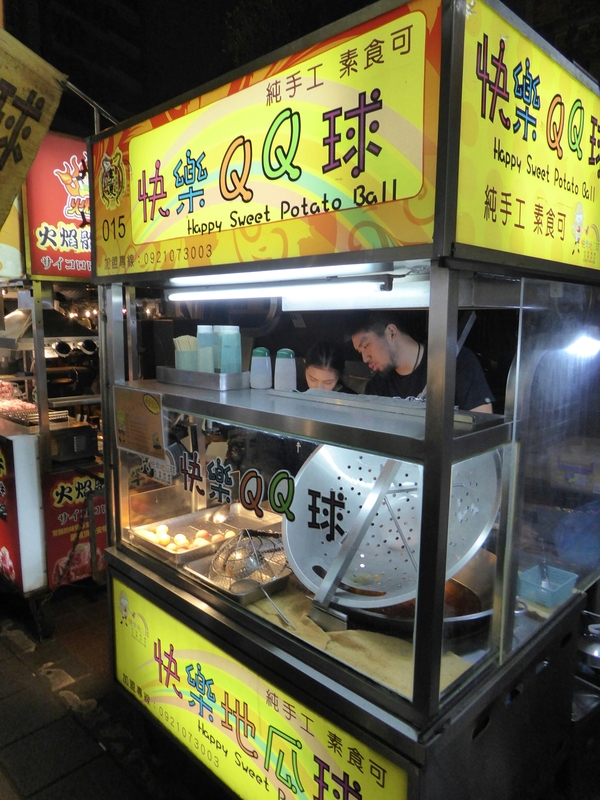 Guy waits for ages for some sweet potato balls. They are fried til crispy but the technique is to squeeze them whilst frying them with that massive looking sieve, we end up with a bag of empty balls, quite odd. 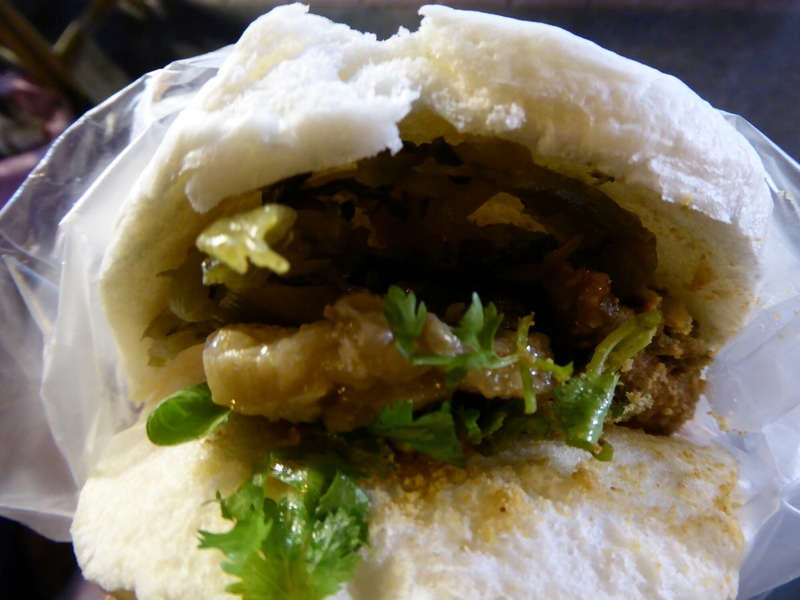 Next up is another pork and mustard greens greens steamed bun for Guy. It is the thing that I keep seeing people rave about on blogs but I am just not that keen, the bun is not that great and the pork isn’t well flavoured, Guy’s comments was ‘it is okay ‘. Finally Guy goes for a local classic, vermicelli with oysters, I am dubious and when it turns up tepid so is Guy! 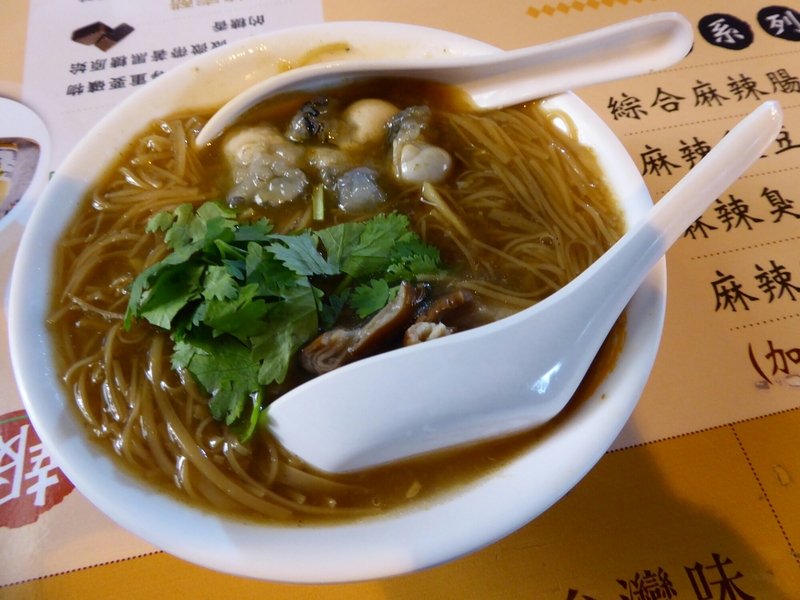 The broth and vermicelli is tasty but we don’t dare try the oysters, neither of us like the snotty little things anyway. 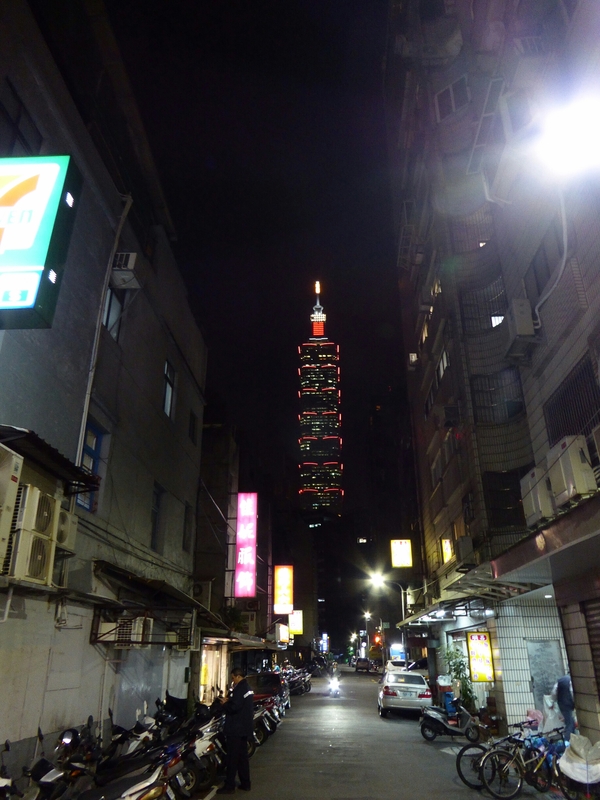 We go back to Taipei 101 to see the big building lit up at night, and see a food court there. The queue for Din Tai Fun was huge, we were chuffed that we had already been when we were in Tainjin!!! The rest of the food court looked really interesting and we make a note to come back here. 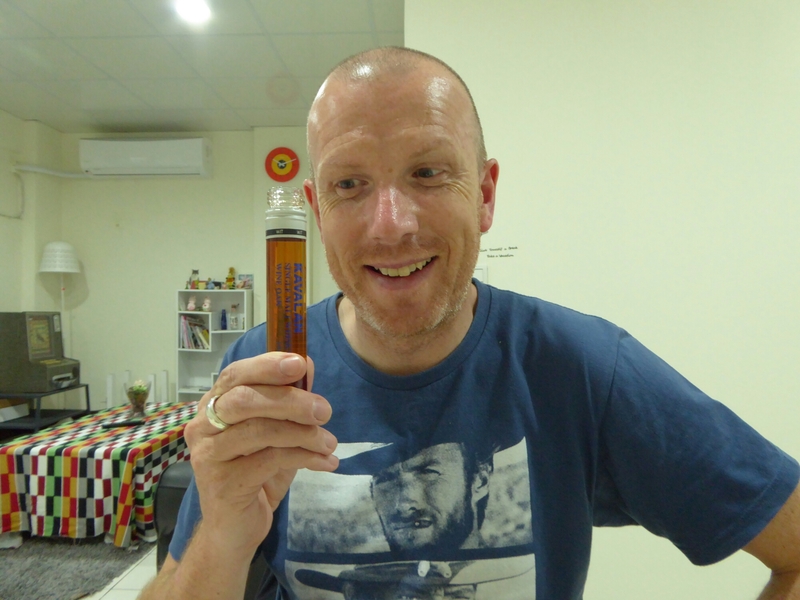 We had seen some local liqueur so needed to try it. 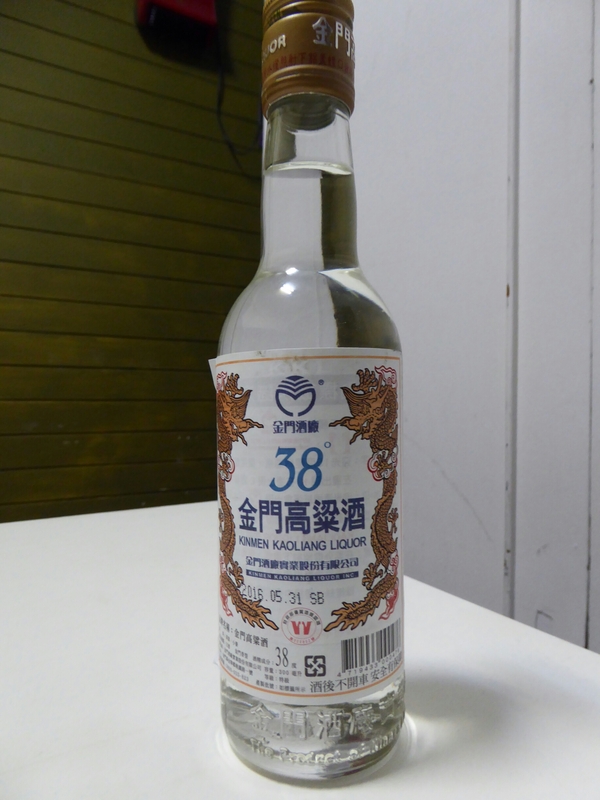 It was strong and tasted of alcohol only, we won’t be repeating that experience! Woken up at 6am-ish by Alison shaking the bed. She asked me what I was doing and we realised it was an earthquake. Once the bed stabilised we went back to sleep. 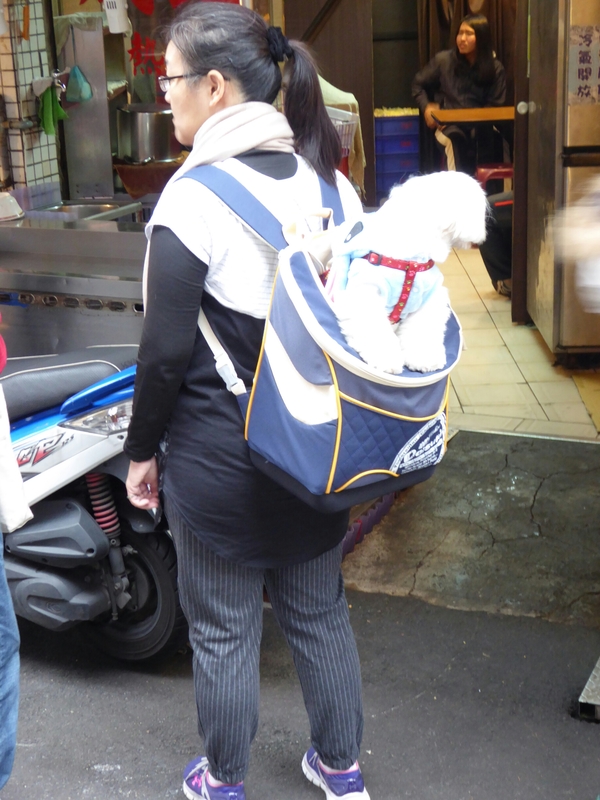 We walked to the local MTR (tube/subway/metro) through the back streets and turned a corner to see a man crossing the road with a dead chicken in his hands. He saw us and in English shouted “Good morning”. We smiled and replied and saw ahead of us a local street market. We slowed down and tried to take it all in, a riotous cacophony of sounds smells and sights. 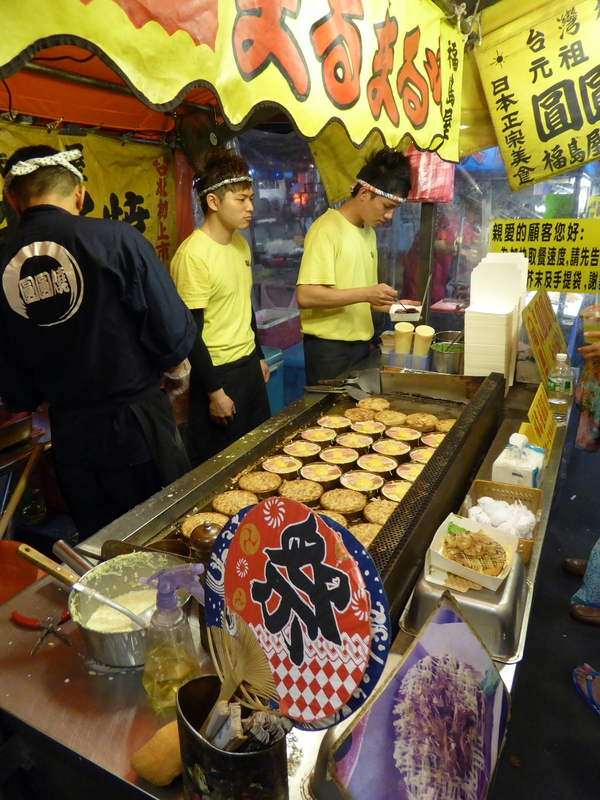 There was fruit, vegetables, fish, meat, tofu, hand made noodles, cooked meals, fried fish, fried chicken, breads, pastries, sweets, sesame paste, pulses, teas, oils, t-shirts, bags and monks. People smiled and said hello. 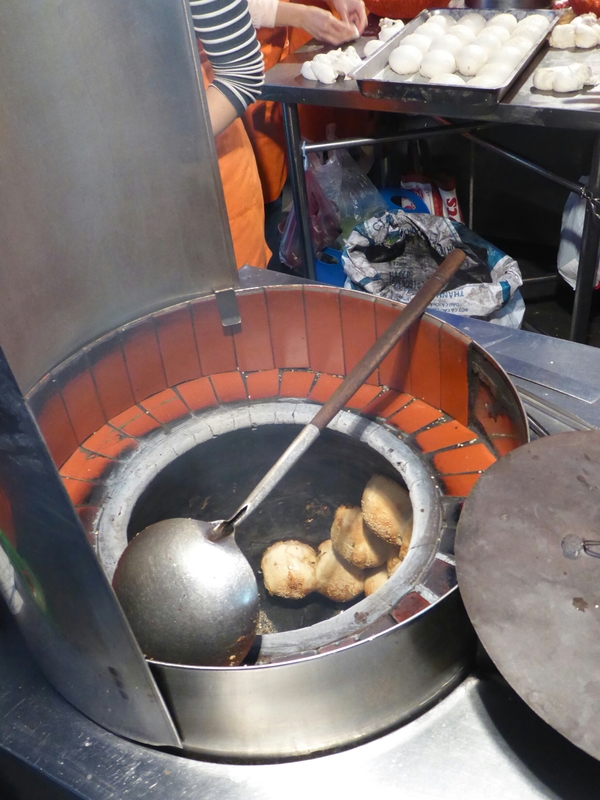 We bought a spring onion bread fresh from a tandoor oven which was deliciously charred and crispy. There were so many colourful images that would have made so many great photos but this was a back street locals market and I wanted to enjoy it and not invade their privacy. We exited the MRT at tourist info and registered for Taipei WiFi. 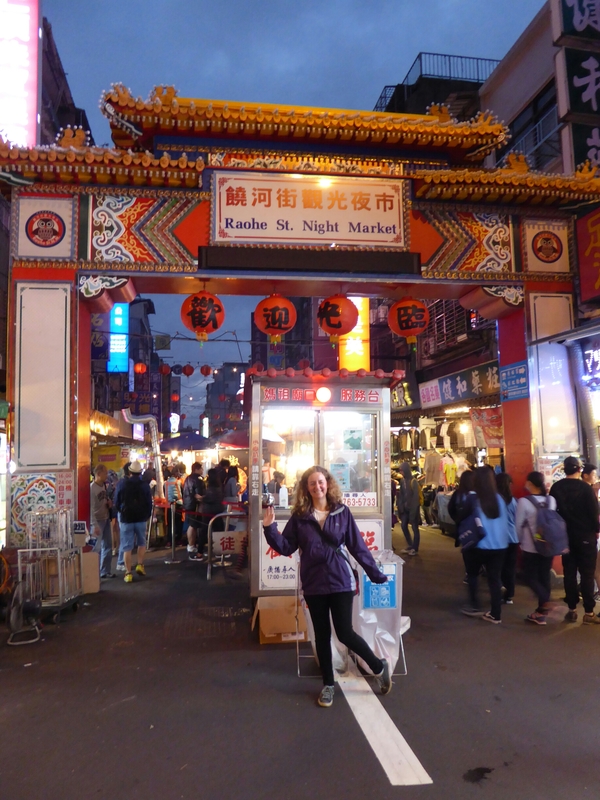 We asked about where to buy a Sim card and for a bike lane map and then Alison released the genie from the bottle and asked where we could buy Taiwanese whisky. The lady replied that there was a shop on the second floor and before she had finished her sentence I was on the escalator. Pub Quiz Question – Who won the WORLDS Best Single Malt Whisky 2015 according to the World Whisky Awards? 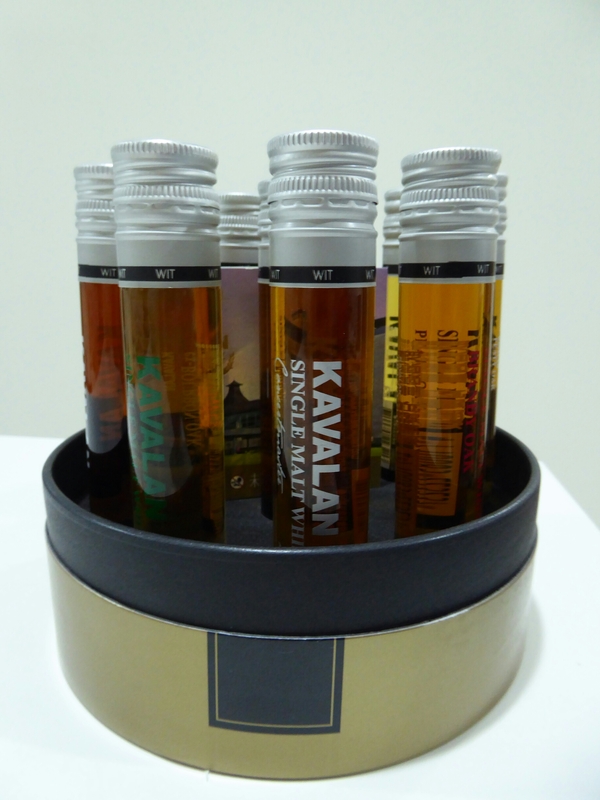 No – A Taiwanese Whisky from Kavalan. The shop had the whole range, aroma bottles for a sniff and a cafe. Al ordered a coffee and a sales lady asked if I wanted to try any samples. 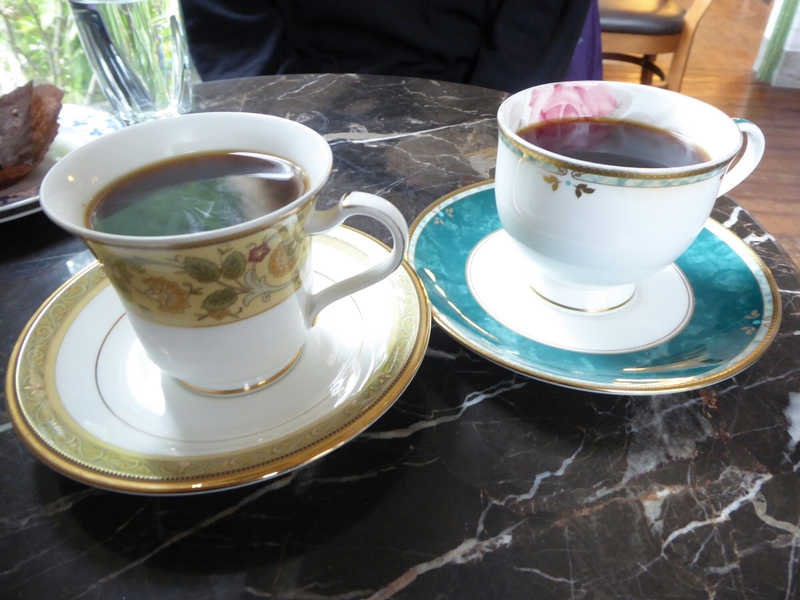 In the interest of the longevity of the trip I told her I’d be back shortly and sat with Al while she drank her coffee. 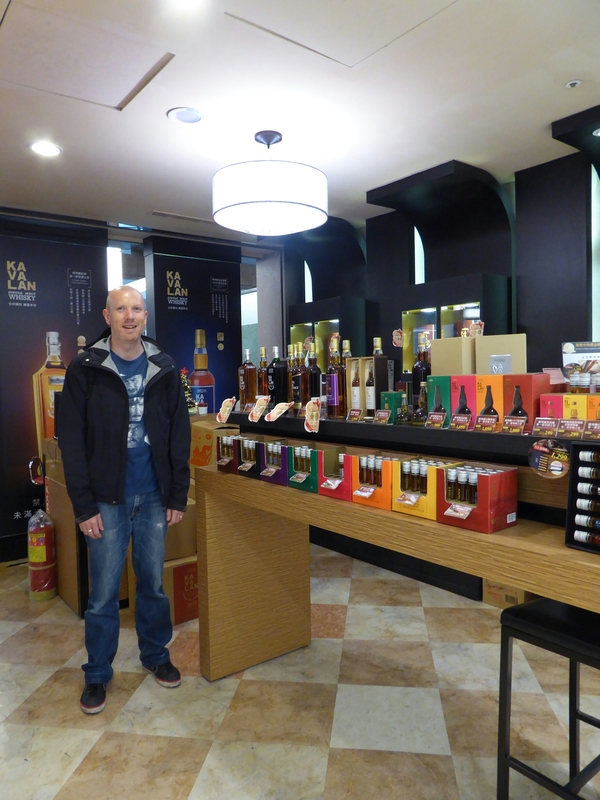 We then tried a few samples before deciding on a case of 10 tasters which included the worlds best whisky 2015. The beautiful presentation case was shoved into the rucksack for the rest of the day. 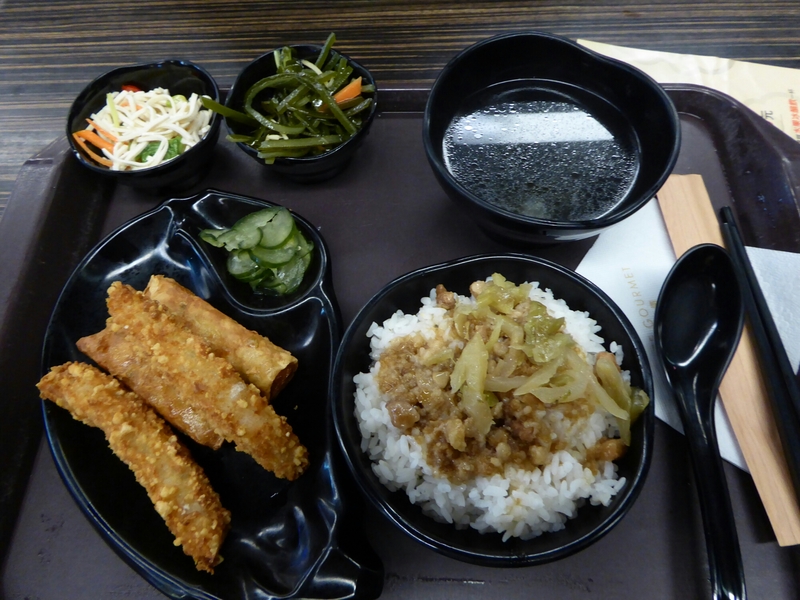 We tried in vain to find the SIM card shop and had lunch in a busy underground food court at the main train station. 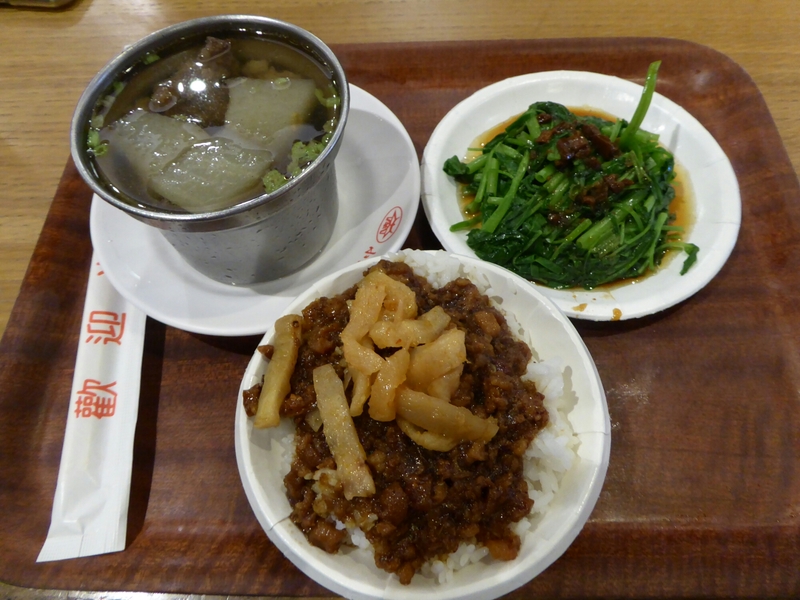 Al had sushi and I had Taiwanese which consisted of pork mince on rice, braised greens and pork rib soup. We then caught the MRT to Tamsui, a historic town to the north of Taipei on the banks of the Danshui river where it spills into the sea of China. 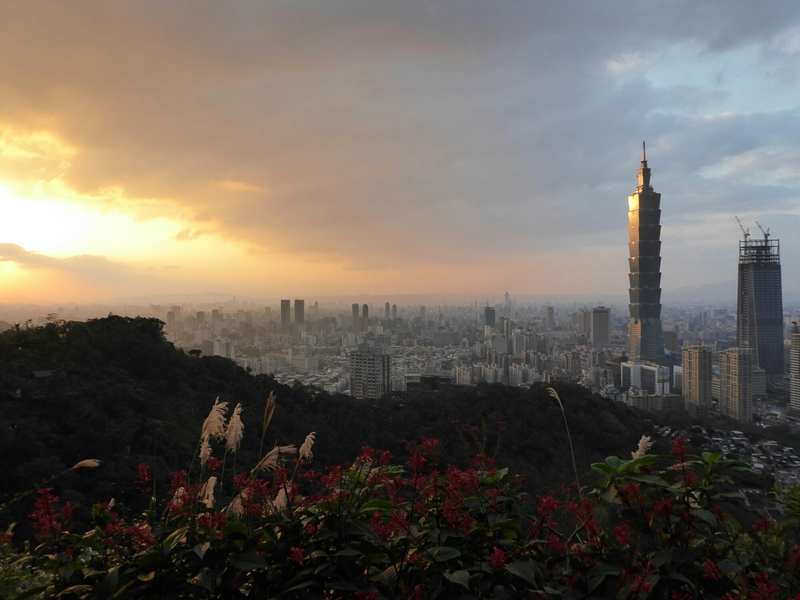 It sounds romantic but in reality there is no break in buildings from Taipei and it seems part of the suburbs. 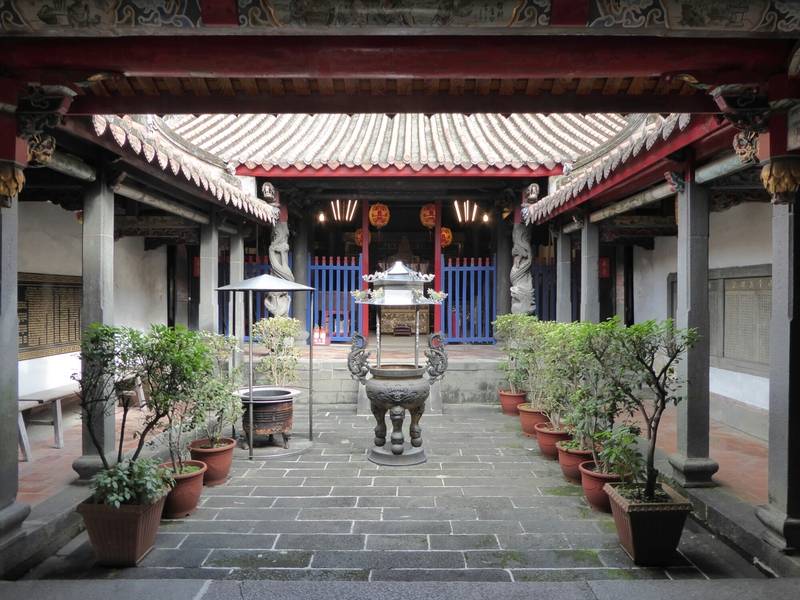 We visit the quiet Yinshan Temple built by Chinese immigrants to worship the Dingguang Buddha, the guardian of Dingzhou. The artwork is very different to other temples we have seen. We wander along the developed riverside with other tourists and locals out for a stroll. Three blokes on air blades whizz past, one blaring out high tempo pop music. 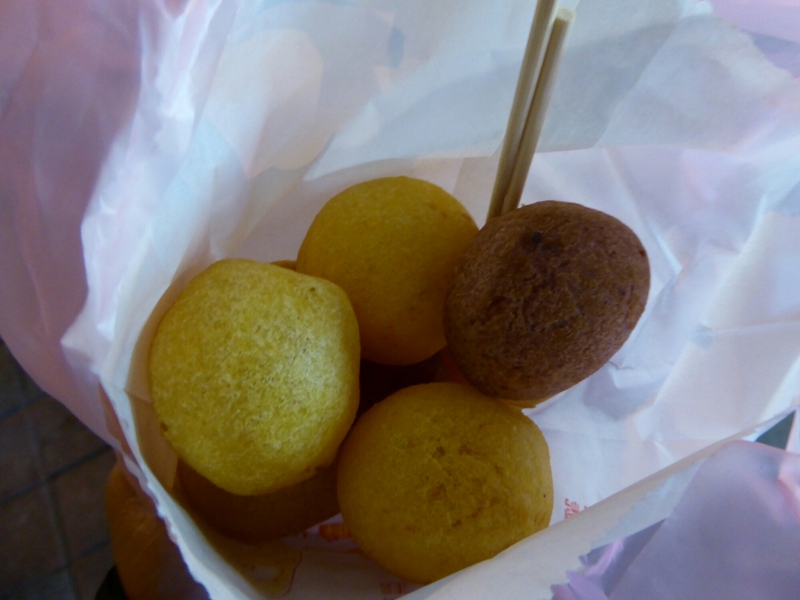 There are school kids enjoying the many snack stalls or trying their luck shooting balloons at fairground stalls. 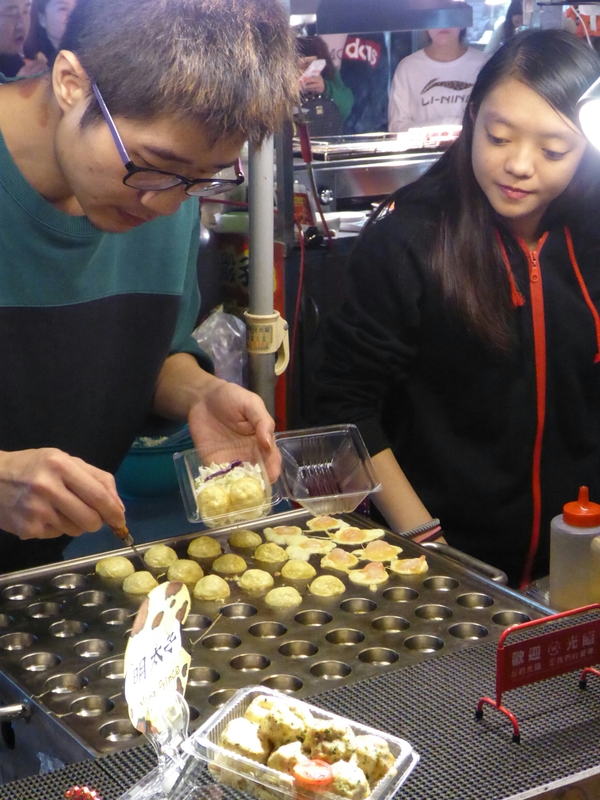 We try some imagawayaki, red bean paste and custard desserts which are hot and sweet. 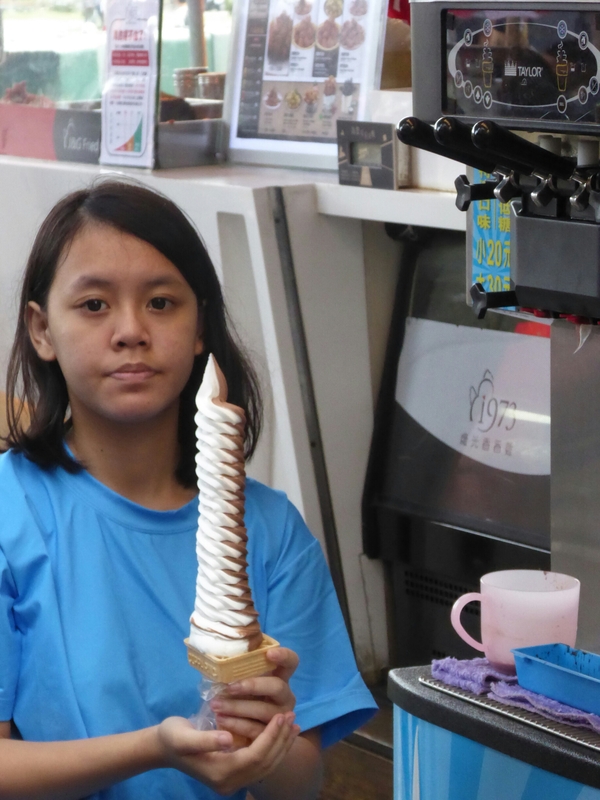 There are also some very tall ice creams being poured. 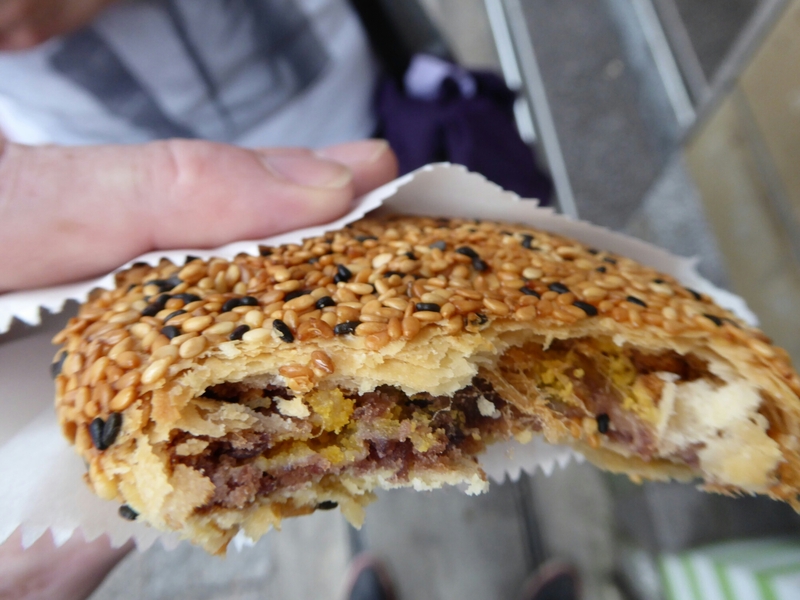 I also can’t resist a pork pie covered in sesame seeds. Very different to the pork pies I love. 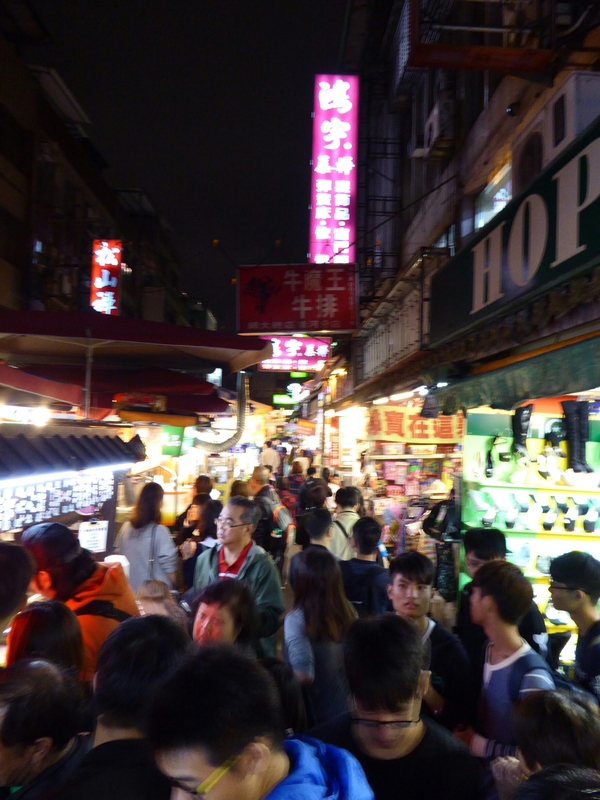 Feeling very relaxed we catch the MRT back into Taipei and get off at Raohe night market which some people claim is the best market. 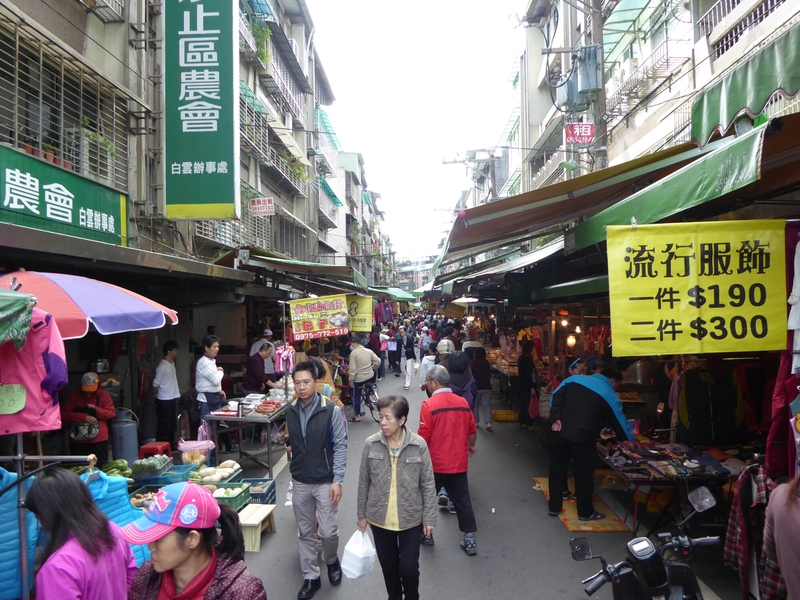 Unlike the rabbit warren of Shilin that we visited last night, Raohe is one straight street with vendors in the centre and on the sides. 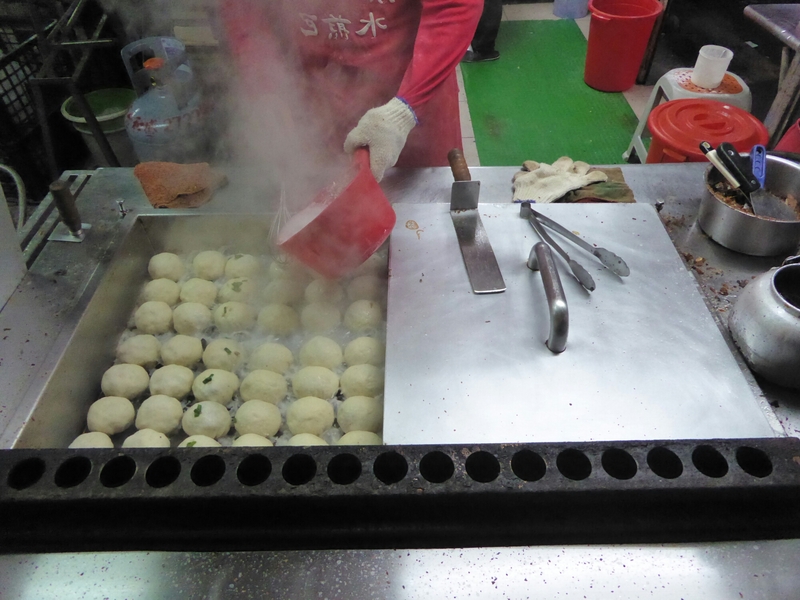 Immediately there are tempting hujiao bing, or baked rolls with peppery pork mince and mustard greens, straight out of the tandoor. Crispy charred bottoms and succulent juicy pork await, but you need patience as they are searingly hot. 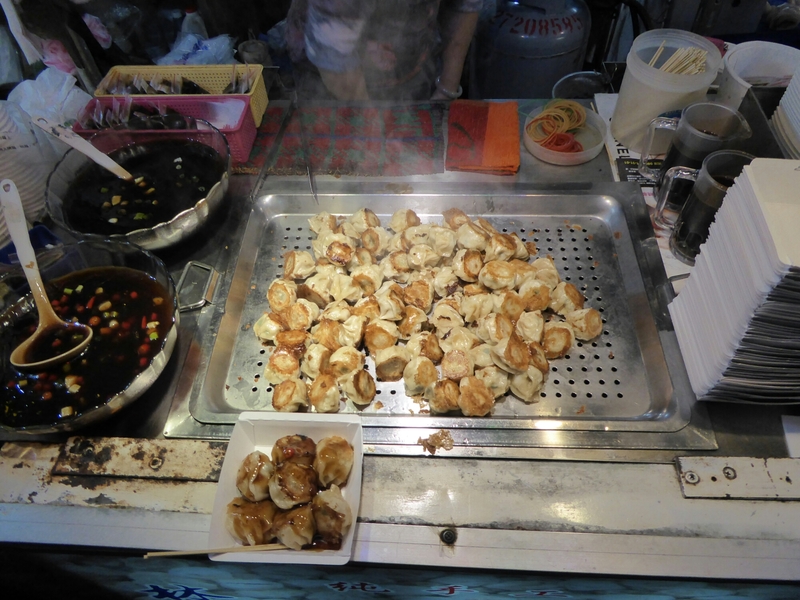 Next are steamed and fried dumplings, similar to gyoza. 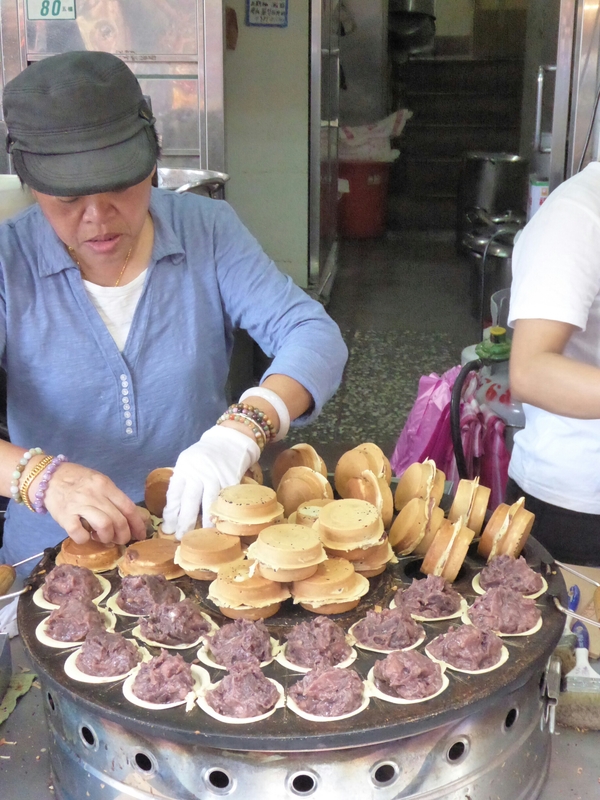 Then, our hat-trick of pork snacks crescendos with xiaolingbao. 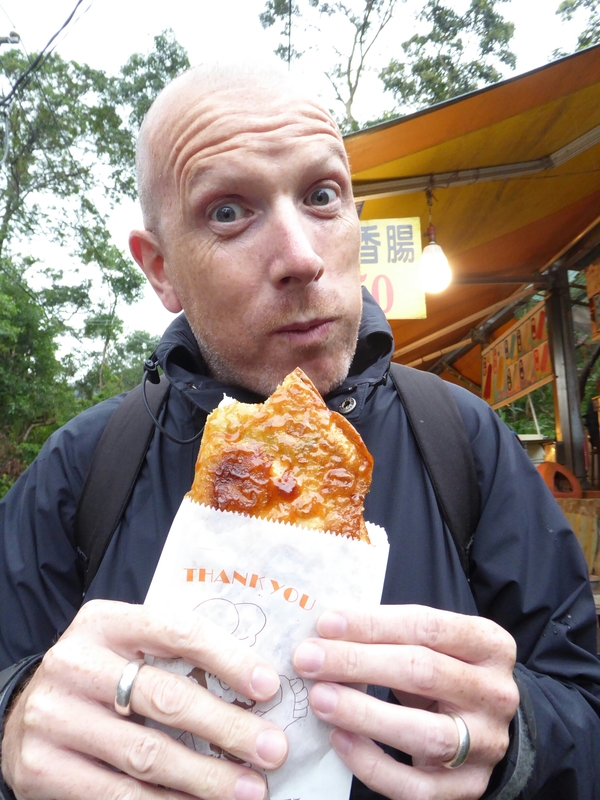 They are very good with translucent pastry, showing the meaty broth inside. 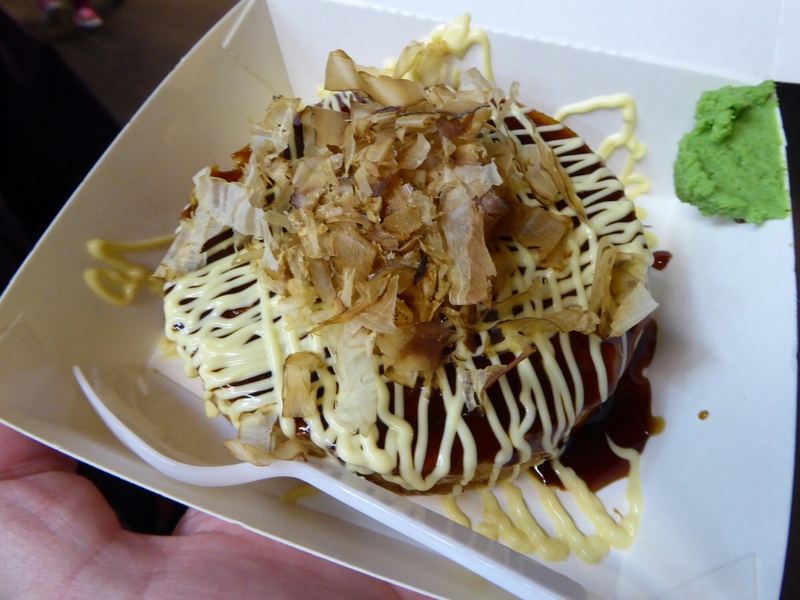 We try a pancake with bacon and egg filling served with wasabi which we presume is Japanese. 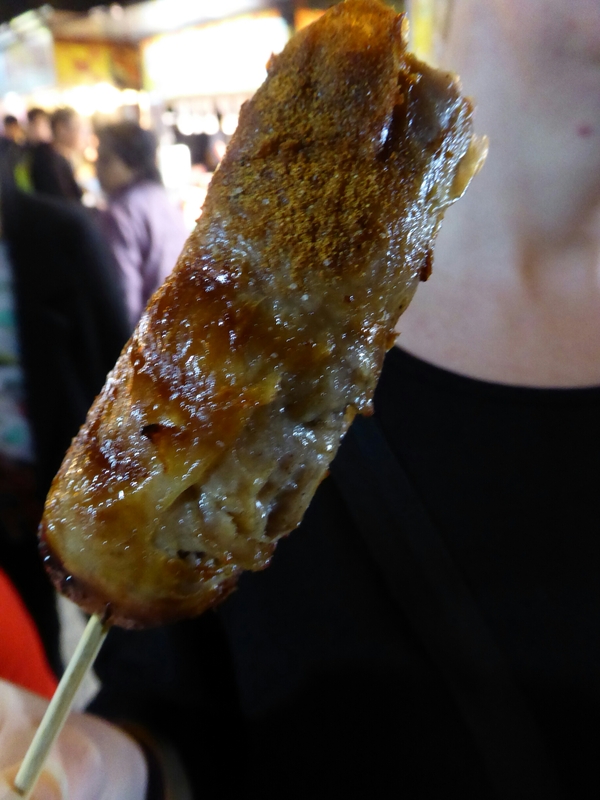 We don’t know exactly what it is but the queue is long, which is a good sign and it tastes great when we finally get it. 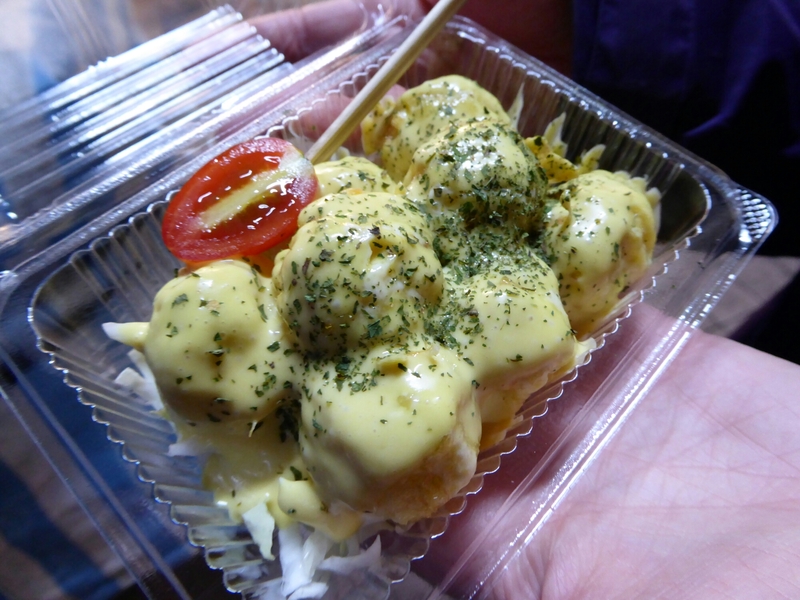 Prawn egg balls with honey mustard mayo. We buy cake to take away and a spicy pork sausage with green veg inside. 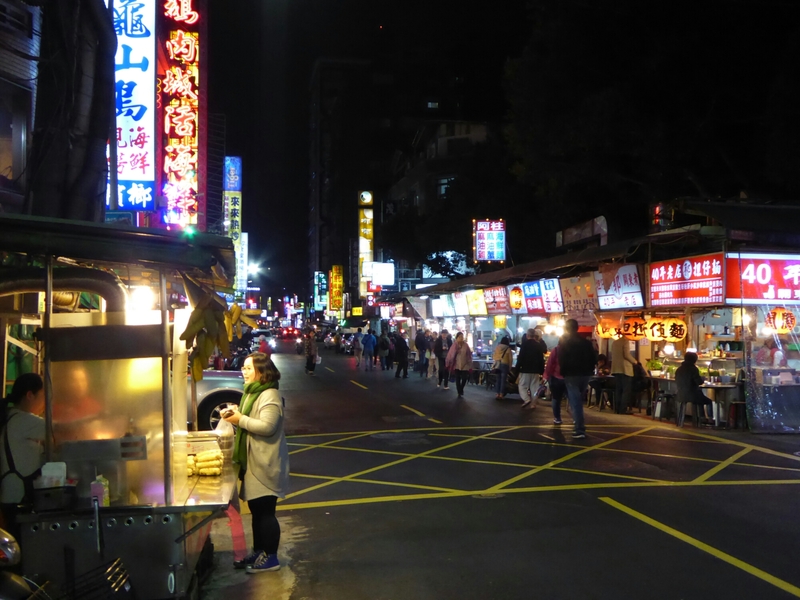 Taiwanese night markets are a great way to eat. 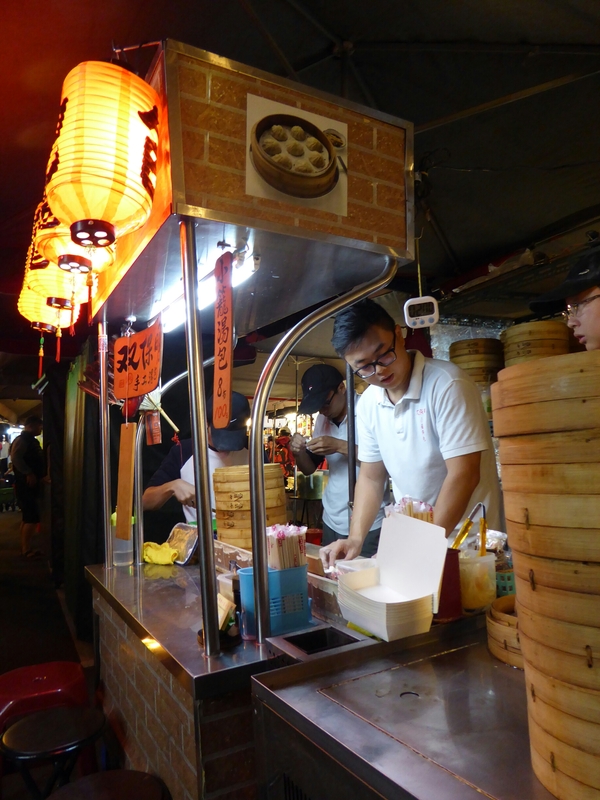 A busy, fun, vibrant atmosphere and an incredible variety of different foods to try. 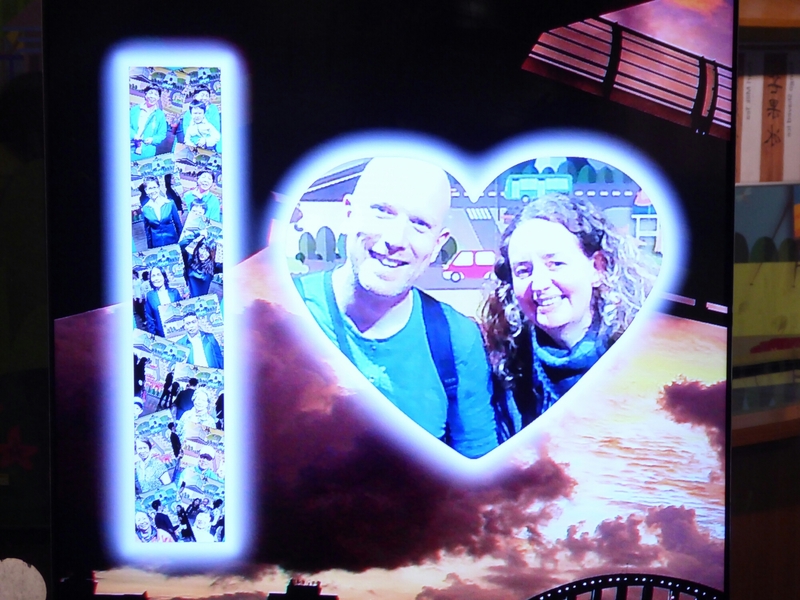 We are loving Taiwan. Back to the airbnb flat and we chat to Fiona and a new couple in the room next door. He is a fireman and she is a law student and they are staying for a few days while flat hunting. 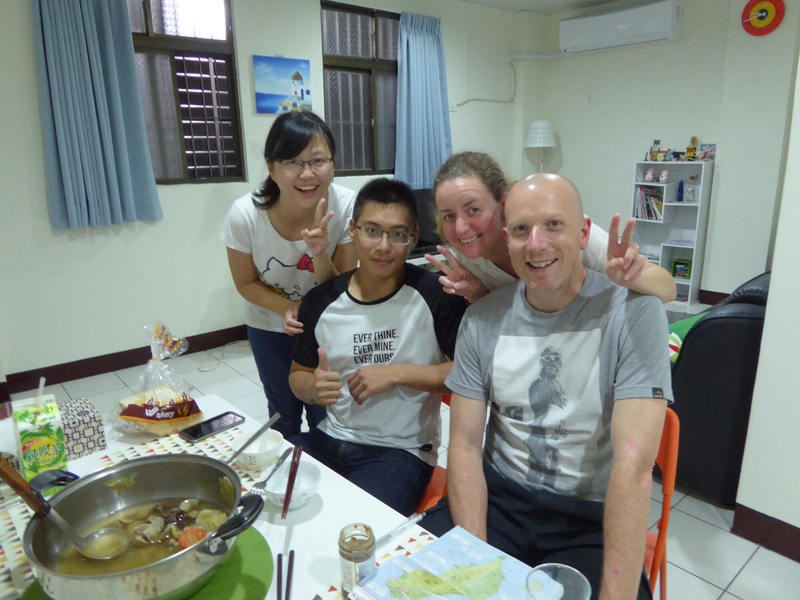 Our Taiwanese / Chinese is terrible but their English is good and Fiona translates where necessary. We enjoy finding out about them and their country and have a lot of laughs. 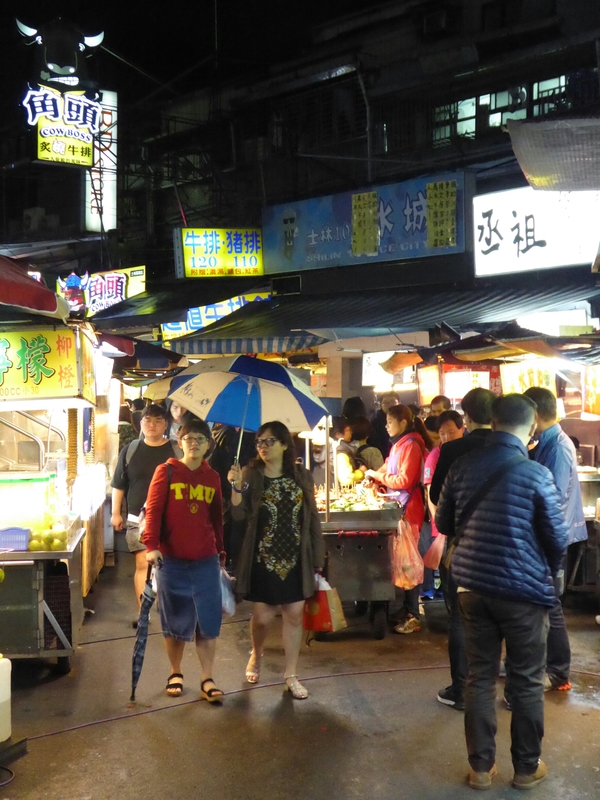 At 10.30pm they go out to a night market for their evening meal! We finally open the whisky which is very smooth and tasty.